What will you choose from life or death when you have the choice to take one ? And who would u give prefernce to: yourself, your family or you friends..? The story is narrated by adhira's doctor friend ridhi.. the story revolves around the girl adhira who is suffering from bone marrow aplasia and has only 8 months to survive..though she is married to akshit from the last 5 years but she prefers to live alone. Blessed with a beautiful gang of best friends consists of 4 amazing people ' siddhartha, priya, shikhar and anirudh' ..
Adhira is a person who achieved everything she wanted and made sure that she gives a way to those people who wandered away from their path and no opportunity through her studio.. you will eventually meet some really great characters like stephy,shikhar .. who all are they? And what changes did they bring in her life ? What happens next? What happened to adhira? Did she survived? What about ridhi? 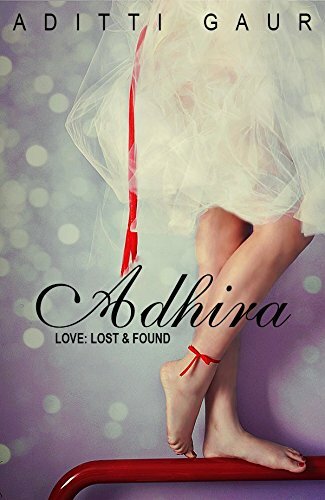 Will adhira get her love back? Is it the end of her love story or starting or a pit-stop? The whole novel is narrated by the third person, unique and a very amazing manner to present a book..
Story has been written step to step to maintain a flow which again will hook the readers up to the story till the end.. This novel is totally women centric and the pains and woes have been scripted amazingly, keeping all the struggles of the lady's life perfectly..
Great and high values and we can say importance to every character is given specifically and the author will teach you to take things calmly and to tackle every condition very smartly and patiently.. Weakness : the beginning is quite slow and boring, and the ending could have been much better.. you will find lack of editing and proofreading ( but these things don't count in the mistakes of authors, editors kindly look into this ).. again platform is not that much strong and could have been much more impressive..book cover just don't match with the story and these mistakes form a part of publisher's mistakes..
An amazing book, uniquely narrated..this book will be loved by the readers for the extraordinary narration and coz of a new story writeup..i loved the way aditti gaur has expressed her emotions .. Die hard love story lovers just grab this book, coz this book will live upto your expectations and will help you to learn to rise up from adverse conditions and stand firm.! !